Access your cloud-based filing system from your unique DynaFile website. 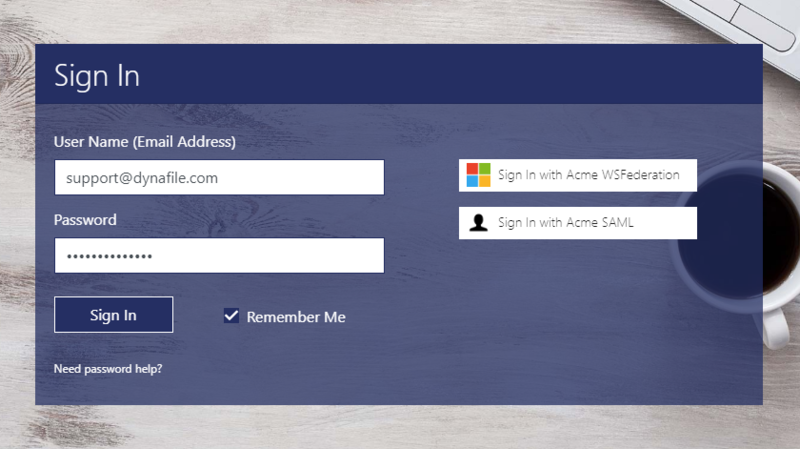 Log in with your company's unique URL. Have your internal company administrator add you to the system. Administrators will have the option to enable Anonymous User Registration in the Site Administration screen, under Security Settings. Users will then be able to request access by utilizing the 'Don't have an Account' button that will appear on the Log In screen. The user will be able to register for their DynaFile site, but will need approval from a system administrator. Users who have lost or forgotten a password should use the 'Need Password Help' button on the home page. Here, you will be asked to submit your email address. This will reset your password and email you a new one. Once logged in, you may make a new password in User Preferences.